Ships today if you order in the next 2 hours 48 minutes. You need the minerals calcium and magnesium in your diet. They both play roles in the maintenance of strong bones, the control of blood pressure, and the regulation of nerve and muscle function. In addition, calcium is involved in hormone and enzyme function, and magnesium helps with the formation of protein and DNA. Vitamin D3 aids in the regulation of calcium absorption, and the maintenance of healthy teeth and bones. 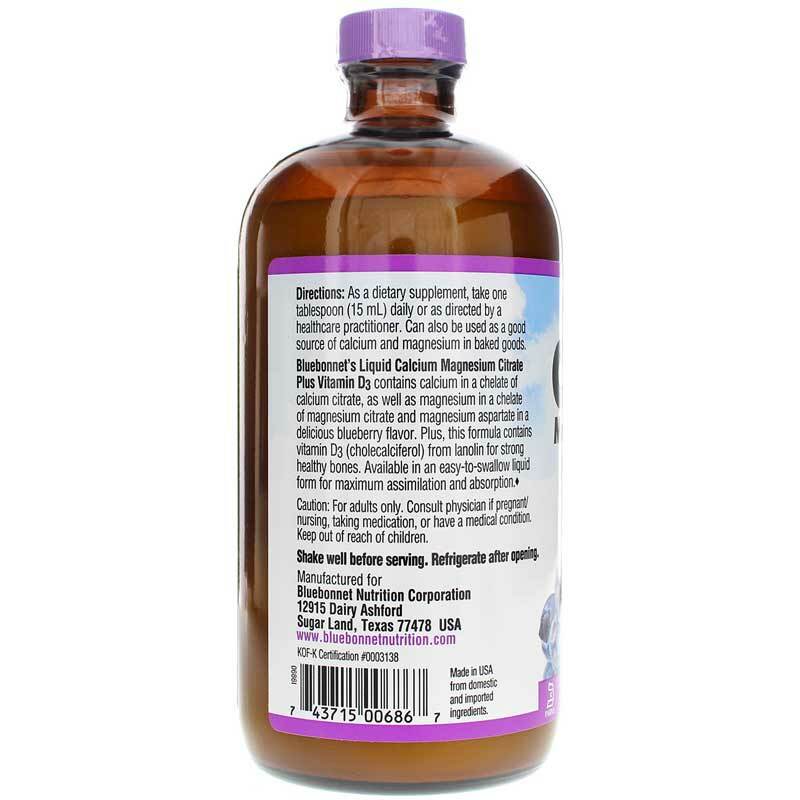 Bluebonnet offers a natural supplement called Liquid Calcium Magnesium Citrate Plus Vitamin D3 that provides calcium citrate, magnesium citrate, magnesium aspartate (in chelate forms) and vitamin D3 from natural lanolin. This formulation contains 600mg calcium citrate, 300mg magnesium citrate and aspartate, and 400 IU of vitamin D3 per one-tablespoon serving. It is free of gluten, yeast, barley, rice, sodium, milk, egg, fish, crustacean shellfish, peanuts, tree nuts, soybeans and wheat. If you're looking for a natural calcium and magnesium supplement that comes in liquid form, check into Bluebonnet's Liquid Calcium Magnesium Citrate Plus Vitamin D3. Order online today! Other Ingredients: Filtered water, fructose, citric acid, natural blueberry, raspberry and strawberry flavor, xanthan gum, sea vegetable extract. Contains NO: milk, egg, fish, crustacean shellfish, tree nuts, peanuts, wheat, soybeans, yeast, gluten, barley, rice and sodium. 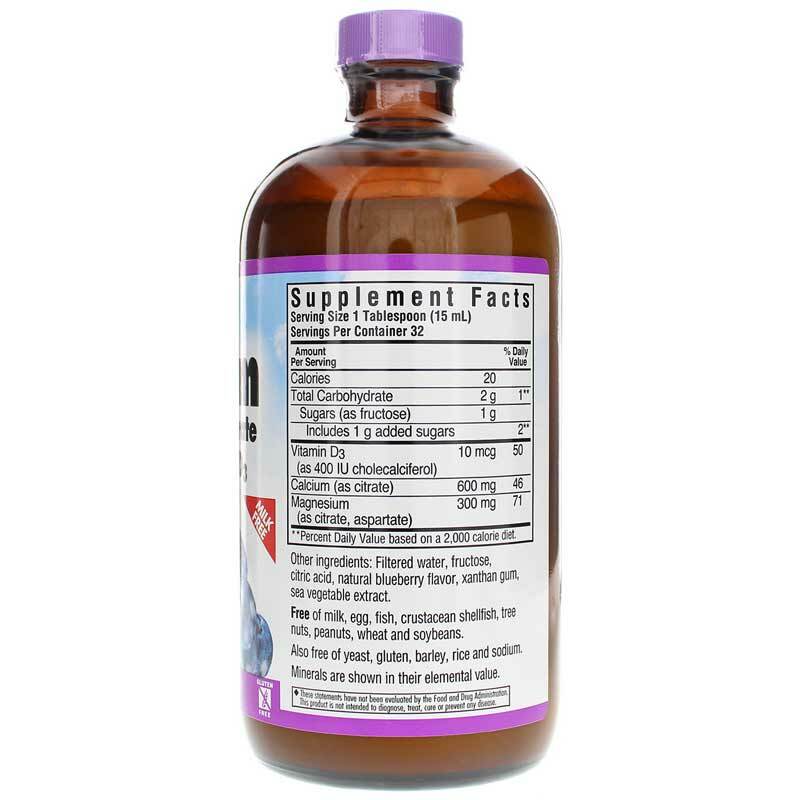 Adults: As a dietary supplement, take 1 tablespoon (15ml) daily or as recommended by a healthcare professional. Can also be used as a good source of calcium and magnesium in baked goods. I have now ordered Liquid Calcium Magnesium Citrate Plus Vitamin D3 Raspberry three times. Each time it has been meticulously packaged. It is a large glass bottle, so this is greatly appreciated. The packing slip is always signed personally with a "thank you". 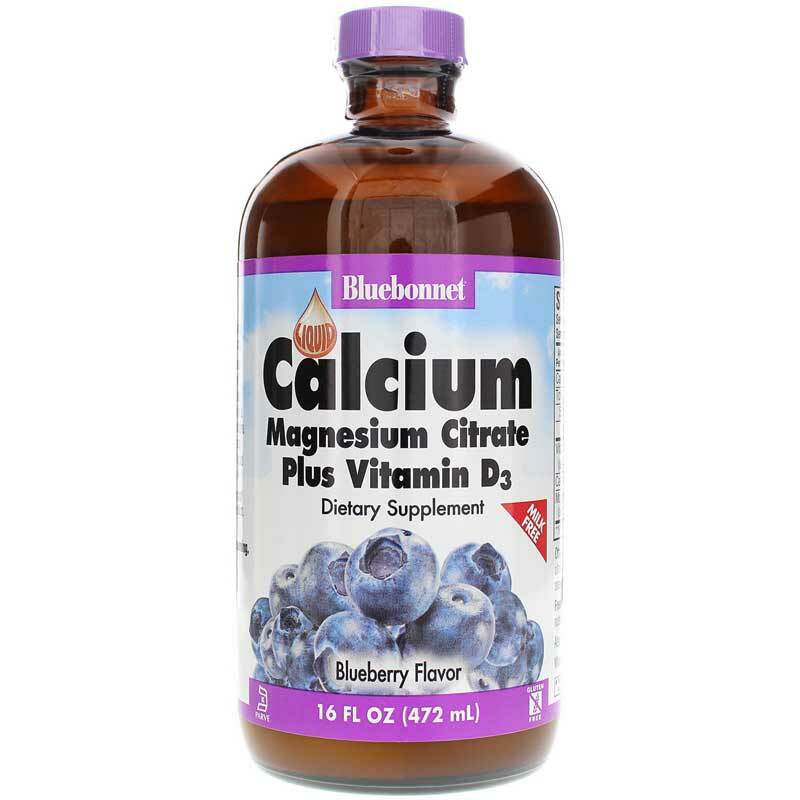 Best deal yet on Liquid Calcium Magnesium Citrate Plus D3 Blueberry...taste and cost! Maybe the word "YUM" is a bit much, but the flavor of the Citrate Plus liquid calcium products isn't bad. I've tried a variety of liquid vitamin products and this is certainly one of the best flavored. I like both the Blueberry and the Mixed Berry flavors. I was very happy to find Bluebonnet Calcium at Natural Healthy Concepts. <br>Also I ordered 4 bottles when I received them one was broken. I called everyone was very pleasant and helpful. I called on Saturday and on Monday there was a replacement in the mail. Thank you. I will recommend Natural Healthy Concepts to friends and family. What a wonderful company to deal with! Never a problem with out of stocks and the free shipping is always welcome!<br>Thank you for your good customer service!